The Pierra Ment’ Hoodie is specifically designed for efficient ski mountaineering. 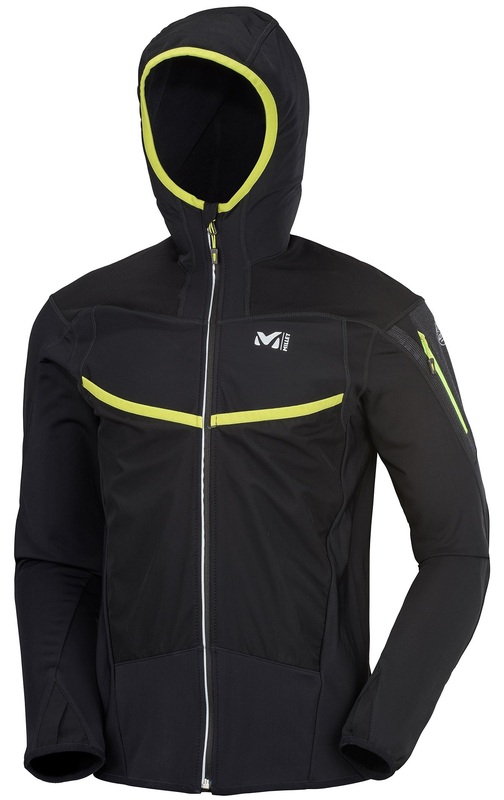 Four way stretch material, external pockets for skins, and a balaclava-style hood will have you up and down the mountain quickly and comfortably. The full-zip hoodie from Millet uses a proprietary Vueltex Knit fabric that is flexible, breathable, and resistant to abrasion. The Pierra Menta-inspired top is great for racing or touring. Thank you Millet for solving our clothing problems. Four way stretch fabric and an alpine fit offer sleek and functional protection. Large stash pockets for skins are top loaded elastic that can accommodate various widths. Flat-lock seams built with a Composit™ construction prevent unnecessary friction. Balaclava hood protects your head and neck from exposure but easily opens with the full zip. Zippered sleeve pocket can be used for energy, phone, map, or what have you. Elastic waist and cuffs hold the hoodie in place, with an optional thumb hole to boot. This is my goto "resort laps" jacket when above ~23f. Fit is perfect for me. Warmth is easily managed via the zipper. Pockets work well enough (depends on where backpack straps lay across it). I really wanted to like this jacket. I like the scuba-style hood and the front pockets. The fit is a bit odd for me. Tight in some places and loose and long in others. But my m complaint is I have a hard time thermoregulating in this. I get hot quickly, then I get cold quickly. I don't seem to get that happy medium that I get with my trusty OR Ferrosi jacket. That said, the quality is just fine and it has been durable. This is a well designed training and racing top that can also work as a general mountain/touring top. I'm short and stocky and the size medium fits snug on the chest and shoulders but the sleeves have some excess and the waist is a little long but it never creeps up farther than I like (Crazy Idea tops seem to fit better for my short size). I often wear this jacket with a short sleeve or tank top underneath and can keep it on all day for touring though I'll have to add additional layers while out for a full day. The jacket is super breathable so doesn't block any wind. The pockets hold skins well enough though I occasionally choose to stuff a water bottle or other items in the front pockets and then put the skins inside the jacket. I've worn this jacket for lots of training and adventures and it's held up well but some of the stitching and seems are fraying or tearing apart. The hood will either conform to fit on my head and stay put or I can wear it over a helmet without any issues. Overall this is a simple and super versatile top. Just my 2 cents after training in this top for about a month a half and 2 skimo races in it. Sizing - go up one size. I'm a medium in most everything and the large here fits perfectly. I like the look and fit of this jacket. Ok now for the criticism- the pockets on the front of this jacket are mesh and the skins get too cold if placed there and lose their stick to your skis. This pocket basically only works for skins if you have a jacket over the top of it. I think if the pockets had a windproof material on the front it would be a lot better. The overall durability of this garment is actually really poor in my opinion. My default sense of good quality is Pearl Izumi and I've had products of theirs for years with no issues. I don't think this product is well made. The top of the pockets (the part with color) got frayed after only a couple skis. The bottom section has areas where the threads and seams are coming apart already. I have a similar jacket/hoodie from Pearl Izumi that I've had for 3 years and no issues at all with these sorts of things. For the price of this jacket I would expect higher quality and more durability to perform. Hi John, Millet stands behind their products, so send in a photo and we can start a warranty for the fraying / coming apart. has anyone raced in this top? I've been training in it and pan to do my first skimo race in it and have tended to stuff the skins inside rather than use the outer pockets because it's been so cold. It would seem to me that the outer pockets with the clear mesh wouldn't allow for skins to stay warm. Maybe I'm wrong here? Anyone care to share their experiences with using the outer pockets for skins? Did they stay warm enough? will you be getting any more of these hoodies in red xl? I'm 6' and 170#. is the L to small? Hi Kurt, unfortunately we will have no more this season. I'm a scrawny 6' 1" 165 and the L fits great. Now that I have both the Dynafit PDG and the Millet PM I thought I'd throw a comment here to help others similarly inclined. First of all, why anyone would tour in anything else is beyond me, unless you like to stop a lot, play with your dog, mow a sandwich or two and kick the sack around between runs. But if you like to move and ski a lot, these tops rule. Anyway, the PDG is a bit lighter (372 grams, Large) and the PM (461 grams, XL and 424 grams Large) is a somewhat burlier fabric and just a tad warmer. I go 6' and 175 lbs and I wear a large in the PDG but an XL in the PM. I could get away with a Large there but it binds in the arm pit and across the chest a bit (all those push ups and pull ups making me MASSIVE!). The XL fits great and the sleeves work even with my +3 ape index. With the PM I do miss the beacon pocket of the PDG which is a handy feature. This is another well thought out piece by Millet. It is your basic top with everything you need and not much of what you don't. I've used this as an outer layer nearly every day and vary the thickness of my base layer under depending on the severity of the weather. Even on snowy days I will throw this on because of its high breathability and have a shell in my pack for above tree line and descents. The two large front pockets are perfect for smaller width skins (>90). There aren't any other pockets except the one on the arm - haven't really found a use for this - but other than that it's a high quality piece with solid zipper and no nonsense design. I'm 5'10" and 155 lbs ... the medium is a perfect "active" fit. I have the Dynafit PDG top, which I love. I had a blow out on the cuff seam but that's easily fixed. Otherwise it's the perfect top for touring. I want to get a second and was thinking of this top just to mix it up. I was wondering if it has a beacon pocket like the PDG. That's a sweet feature. Hi Brian, unfortunately the hoodie does not have a beacon pocket. Just the two skin dumps and the upper arm deal. i m a solid size US M (5 9", 160lbs, 40" chest)in most major brands. on this chart i got kinda confused myself or its totally off.. my dimensions seem to go with size US L, but in practice its just loose, sth more than M but less than L. should i go M and just ignore it?? 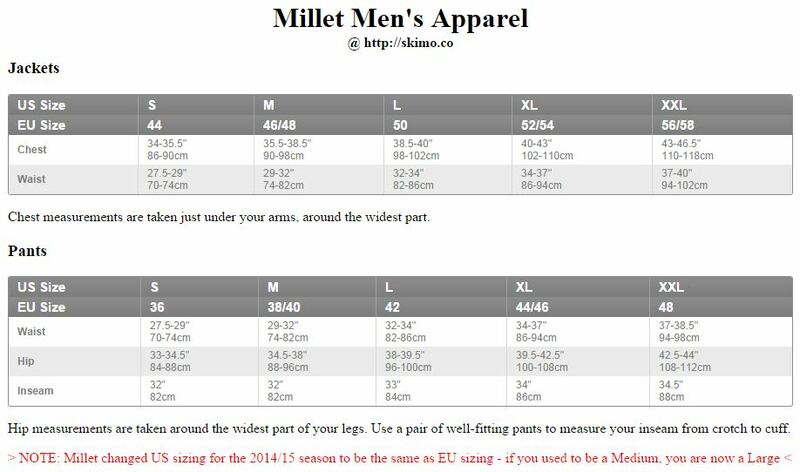 Hi Simon, Millet has started using Euro sizing globally, which is usually around a size smaller than US. So L is similar to US M in other brands. Your chest size matches up with the Large as well, so that should be the way to go. Overall great hoodie for what it's designed for. Bought this for some longer races (i.e. Grand Traverse) as well as longer/faster tours in the winter and spring. Material is super stretchy and warm but still breathable. There are some nice less-fleecy sections (in black) that are a bit more durable under a pack but still stretch. It's by no means wind/water proof but does pretty well, especially if you're moving. Sleeves are long/stretchy enough that the thumb holes are actually usable (a rarity!) and the hood fits well under a helmet. Skin pockets are great and it's hard to go back to just stuffing them down the front of your jacket. Pocket on the sleeve is nice for small stuff but watch the zipper as it has a tendency to slide down if you're moving a bunch. I've used it in blowing snow down to about 0 with a light baselayer underneath and as long as I was moving, I never wanted more warmth. I do question it's durability in the long run (I've had some threads pull out of the skin pockets that I fixed with some seam grip after the first day) but then again, this is a light-weight specialty piece that's not supposed to be super burly so can't really fault it when I was jamming smaller but non-race sized skins in the pockets. Definitely a great top if you want something on the lighter/faster side with a tad more protection than spandex. 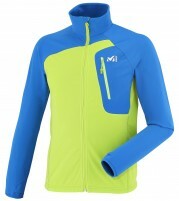 Please compare the Millet Pierra Menta to the Dynafit PDG top. Which is warmer, wind resistant and pros/cons of each in comparison. Hi George, the Millet is a tad warmer and more casual / looser. Similar soft interior though the PDG feels slicker on the exterior. Neither offer great wind/weather protection, but both are very breathable. Skin pockets are great. If you appreciate this type of top, you'd probably be happy with either.